Have you ever wondered what causes teeth to stain? There are a variety of things that can negatively affect the color of your teeth. Over time most people’s teeth tend to become discolored or stained. Whether this is from smoking, coffee, or various foods, it can be corrected with cosmetic teeth whitening at Sarasota Dentistry. Dr. Hank Michael is an experienced cosmetic dentist, treating patients in Sarasota since 2001. Our office, Sarasota Dentistry, offers a safe, inexpensive solution to a less-than-white smile. Whitening your teeth is a very simple procedure that can be completed in relatively short period of time. If you’ve been worried about the appearance of your smile, perhaps it’s time to consider professional teeth whitening. There are several types of teeth whitening systems available, and they all work a little differently. You could use whitening toothpaste that does not contain bleach, which could whiten your teeth a bit. But whitening strips, gels and rinses have become more popular in the past ten years. These methods are effective because they chose to use bleaching agents like carbamide peroxide or hydrogen peroxide to lift stains from deep in the teeth. Of course, years of research have shown these agents to be perfectly safe for the application of teeth whitening. Although there are a variety of options for anyone interested in teeth whitening, a dentist or other qualified oral health professional is the best person to choose if you want assured results. While there are proven over-the-counter techniques, they can be uncomfortable and time consuming as compared to custom fabricated teeth whitening trays made by a dentist. Dr. Hank has experience with many types of teeth whitening systems and products, and will help you determine which will be best for your smile. At Sarasota Dentistry, teeth whitening is one of the more popular cosmetic dental treatment options we have available — it is simple, effective and safe. Whitening only works on natural teeth. Existing crowns, bonded fillings, and other dental restorations do not whiten with teeth whitening systems, therefore, the whitening procedure may not be effective in all cases. Dr. Hank will determine the best teeth whitening process for your needs. If you’re interested in getting your teeth whitened, contact Sarasota Dentistry today! Dentists and dental experts have ten years of completed research that indicates teeth whitening methods to be safe and effective. 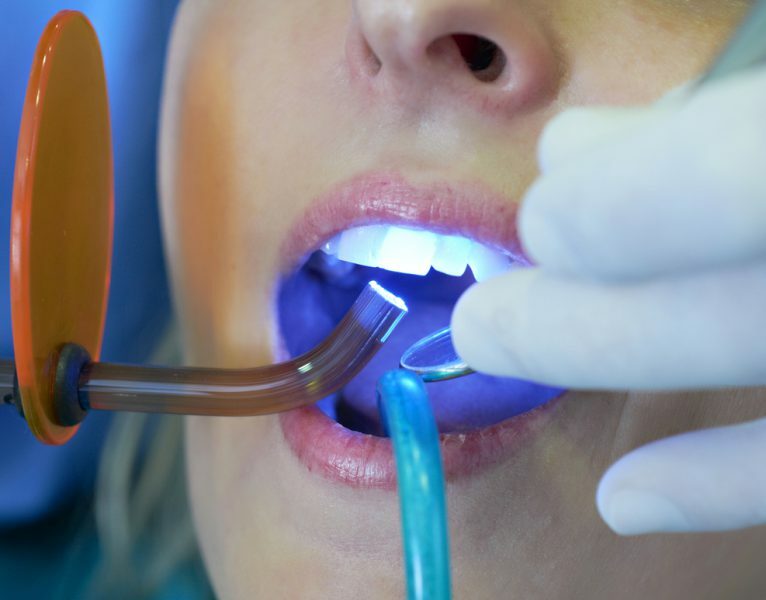 There are a variety of systems used for teeth whitening procedures today, and Dr. Michael has explored most, if not all of them, over the past 10 to 15 years. If you are looking at an at-home teeth whitening system, it is best to consult with your dentist to determine whether or not the products are clinically proven and worth the effort. The first step in the teeth whitening process is to make a stone model of your teeth. This is done by taking impressions of your upper and lower teeth and then then Dr. Michael pours dental stone into the impressions in his dental lab. After the models have hardened and been trimmed, a thermoplastic whitening tray is fitted to the model and trimmed to fit in your mouth perfectly. This impression taking visit usually takes about 20 minutes. After this visit, you will be scheduled one week later for delivery of whitening trays. The second step is to try the whitening trays in to verify they fit correctly. This is done here at the dental office. Once the fit is verified, the doctor or the dental assistant will go ahead and show you how to load the trays with whitening gel. The loaded trays will be placed in the mouth and any excess whitening gel will be removed. This loaded whitening tray is to be left on the teeth for 30 minutes, so patients usually head home right after the trays are placed in the mouth. Some patients do not start the whitening process in the office; they take their trays home and start the first application at their discretion. The treatment generally requires daily applications for at least 2 weeks. While some may see significant results in as little as one application, others with deeper and darker stains, require additional and persistent whitening applications. Dr. Michael has seen some cases of Tetracycline staining respond well to teeth whitening when performed daily for 2-3 months. Additional whitening gel can be purchased here at Sarasota Dentistry. Following the initial treatment, patients are encouraged to re-whiten after routine dental cleanings. 3-5 days worth of whitening treatments following your dental cleanings will ensure that bright white smile you love. First you'll brush your teeth, then place the whitening gel in tray as instructed, place tray on teeth and leave it on for 30 minutes, remove the trays, brush your teeth again, and finally brush and rinse the trays. Tooth sensitivity is something that should also be taken into consideration as you begin teeth whitening. It can usually be relieved by reducing the time the whitening gel is left on the teeth. It can also be alleviated by placing a sensitive tooth paste such as Sensodyne or Soothe RX in the whitening trays and putting them on teeth for 30 minutes before and following the teeth whitening session. Whitening treatment should only be done once per day. If done more frequently it can cause blistering of the gum tissue which can be very uncomfortable. If you accidentally leave your trays in for too long, don't worry, just stop whitening treatments for three days before resuming your whitening treatment. Gum tissue repairs itself quickly. Treatment should continue for 7-10 days and one tube of whitening gel should last through all of these treatments. Refills of whitening gel can be purchased here at the office. Does teeth whitening require any follow-up visits? This visit is scheduled 2 weeks after you start teeth whitening. During the appointment we measure how many shades whiter your teeth are. Most patients are very happy with the results of teeth whitening, however, some patients do not feel their teeth are white enough and want to continue with the process. It is a fact that some patients get whiter teeth than others, and this is typically due to deeper staining in the teeth. In severe cases, patients have the option of whitening with porcelain veneers to cover the deep stains in their teeth. Will my teeth be permanently white? Teeth whitening is not permanent. Exposure to certain types of foods,beverages, and activities can cause the teeth whitening to start fading in as little as one month. Avoiding foods, beverages and activities that stain the teeth will help prolong the whitening effects. Some patients are able to maintain their whitening for a year or longer before touch up is needed. The amount of whiteness your teeth will show varies depending on the condition of your teeth, the level of staining, and the whitening system being used. Our recommendation at Sarasota Dentistry is to use your whitening tray system for a few days after each dental cleaning to maintain your desired whitening results. What should I know before teeth whitening? Teeth whitening only whitens teeth. If you have fillings, crowns or veneers, teeth bleaching solutions will not work on these surfaces and you need to consider that some additional cosmetic dentistry may be required following the teeth whitening process. Usually patients seeing such brighter teeth are excited to replace old discolored dental restorations with a new, whiter matching dental restoration. "My fitting for my invisaligns went smoothly with easy to follow directions for their use."